EMS Race Team is powered by EMS+ and driven by Chairman JW to raise awareness for the PETA Cruelty Free campaign. 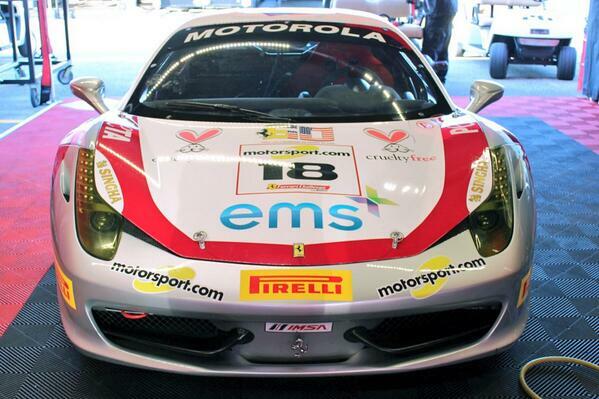 This past weekend, EMS Race Team competed in the Ferrari Challenge at Daytona International Speedway. After qualifying third the day before, EMS Race Team finished second-in-class when the checkered flags came out on Saturday for Race 2. The finish was also good for seventh overall in the Ferrari Challenge competition that included 13 pro class and 14 amateur drivers among the field of 27. Photos and video from race weekend at Daytona are included below. Our digital team at EMS+ was lucky enough to make the trip and enjoyed the opportunity to provide live updates on Twitter @emsRaceTeam throughout the weekend. EMS Race Team’s car, Erin, heads out to the track with Auto Gallery Motorsports teammate Carlos Gomez from Axis of Oversteer. We shot this video of Erin driving toward the track just before snapping the above still-shot from the back of our golf cart. Competing in the Coppa Shell Class, EMS Race Team ran strong enough to conclude the trip with a podium finish. Our photographer, Merrell, captured the above action along with the scene surrounding the Ferrari Challenge podium after the race. The Cruelty Free Bunnies looked great too, featured on both the hood and rear bumper of the car. Unfortunately, most of the drivers weren’t close enough to see the bunnies when Chairman JW crossed the finish line in firm command of second place. It was a fun race all around and great experience to watch from The Pit Road Patio at Daytona. We watched the qualifying lap from a different vantage point, and here’s some video of the car and track from that spot on Friday. You can check out EMS Race Team’s Vimeo page for footage of Race 1 on Friday. A technical issue prevented Saturday’s video from recording. Always fun to end the weekend with a trophy. Congrats to EMS Race Team for doing just that and raising awareness for the PETA Cruelty Free Campaign along the way!